Queen, the band, seems as hot as they’ve ever been. Thanks to the excellent bio-film, “Bohemian Rhapsody,” Queen is enjoying yet another career re-birth. Last night at the Golden Globes Awards show, the film scored the band two big wins: Best Motion Picture – Drama and Best Actor in a Motion Picture – Drama. 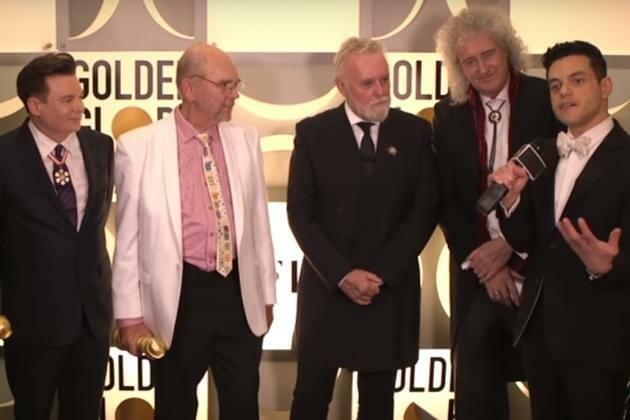 Here are Brian May, Roger Taylor, Rami and some guy named Mike Myers talking to the press after the huge night for Queen!